This blog post was written by Jason McEwen. The standard model of cosmology assumes that the Universe is homogenous (i.e. the same everywhere) and isotropic (i.e. the same in whichever direction we look). However, are such fundamental assumptions valid? With high-precision cosmological observations, we can put these fundamental assumptions to the test. Recently we have studied models of rotating universes, the so-called Bianchi models, in order to test the isotropy of the Universe. In these scenarios, a subdominant contribution is embedded in the temperature fluctuations of the cosmic microwave background (CMB), the relic radiation of the Big Bang. 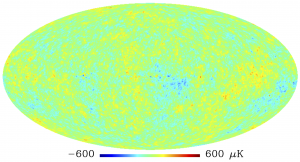 We therefore search for a weak Bianchi component in WMAP and Planck observations of the CMB – we know any Bianchi component in the CMB must be small since otherwise we would have noticed it already! Intriguingly, a weak Bianchi contribution was found previously in WMAP data. Even more remarkably, this component seemed to explain some of the so-called ‘anomalies’ reported in WMAP data. We since developed a rigorous Bayesian statistical analysis technique to quantify the overall statistical evidence for Bianchi models from the latest WMAP data and the recent Planck data. When we consider the full physical model, where the standard and Bianchi cosmologies are coherent and fitted to the data simultaneously, we find no evidence in support of Bianchi models from either WMAP or Planck – the enhanced complexity of Bianchi models over the standard cosmology is not warranted. 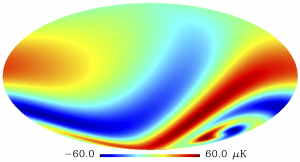 However, when the Bianchi component is treated in a phenomenological manner and is decoupled from the standard cosmology, we find a Bianchi component in both WMAP and Planck data that is very similar to that found previously (see plot). So, is the Universe rotating? Well, probably not. It is only in the unphysical scenario that we find evidence for a Bianchi component. In the physical scenario we find no need to include Bianchi models. However, only very simple Bianchi models have been compared to the data so far. There are more sophisticated Bianchi models that more accurately describe the physics involved and could perhaps even provide a better explanation of CMB observations. Evidence of vorticity and shear at large angular scales in the WMAP data: a violation of cosmological isotropy?